Welcome, my name is Pauline Durand, Secretary General of the 6th edition of SPRIMUN. I have been studying in Rennes since 2014, and after an Erasmus year in Siena (Italy), I’m back in Rennes for a master’s degree in International Studies. Several years after taking part in simulations in Scotland, Rome and Rennes, I am completing my MUNer experience by leading this year’s team for, hopefully, a wonderful conference. Greetings, delegates! My name is Zacharie, I am a 4th year student in European affairs and political science at Sciences Po Rennes. My passion for Model UN was born during my early days at university when I discovered this thrilling hobby on campus. Since then, I have participated in several MUN conferences such as ScotMUN, PragueMUN and several editions of SPRIMUN. I have been a delegate and a chair multiple times, but this year I wanted to try something new: that is why I joined the Secretariat for the 2018 edition of SPRIMUN. I hope you are as excited as I am, because this year’s SPRIMUN is going to be amazing! Hello, my name is Paul and I am currently in a Master’s Degree in Risks and Quality Management in Sciences Po Rennes. I spent last year abroad, studying economics and politics in Japan. I also had an experience as an intern in banking, where I developed my skills in finance and project management. 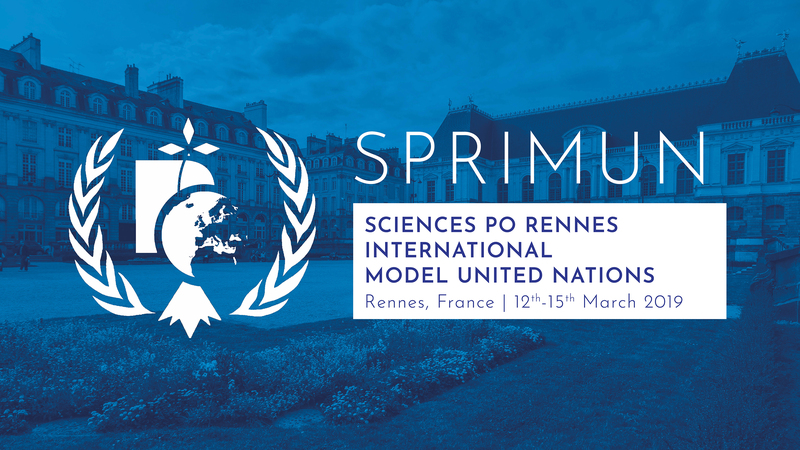 Since I joined Sciences Po Rennes in 2014, my interest in international relations and development made me a MUN enthusiast. I had the opportunity to take part in MUNs in Scotland, Czech Republic and of course SPRIMUN, which led me to join the adventure with the 2018 organization team. Hi, I am Emma Iddir, the partnership manager for SPRIMUN 2018. I am a student in political science, studying for a master’s in “organizational communication”: hence, my professional future could lie in the fields of marketing, public relations or internal communication. I joined the team because I wanted to discover the “other side” of SPRIMUN. I think it is also a great professional experience, linked to my master and the areas in which I would like to work in the future. I joined the team because I am a MUN lover: I attended SPRIMUN and PragueMUN twice and I will be attending ScotMUN in 2018. I am currently studying for a master’s in political science and studied at the world-famous Waseda University in Tokyo (Japan). I’m the newest team member in terms of MUN experience, but it’s of course nothing that my motivation can’t overcome! I’ll be in charge of logistics and socials as well as communication, which means I will find the best places in Rennes for you to enjoy the city at its best!